05. Auto Lift Sliding Jack 3,500 lb. Owning a good portable car lift is a great way to ensure that working underneath your car is much safer and easier even while on the go. With a portable lift, you not only have a time-saving tool in your garage but you can also store it in the trunk of your car for in case things get challenging when traveling. Well, there are many types, brands, and models to choose from when it comes to portable car lifts. But what should you consider when selecting a suitable lift for your car out there in the market? Of course, some of the most important considerations would be things such as safety, performance, durability, strength, and ease of storage, pricing, and other aspects such as warranty. Going through consumer reviews and product descriptions and making comparisons based on these considerations can sometimes be quite a hectic and time-consuming way of selecting a good unit. If you’ve decided that your garage could use a new car lift and are looking to purchase one, here are the Top 5 Best Portable Car Lifts you might want to consider. Even though it has a 3,500 lb capacity, this is one of the cheapest models among the top 5 best car lifts. The Auto-Lift Sliding Jack is designed for easy storage, thanks to its adjustability. It also comes with movable stand extensions and can fit most storage lifts that have a sliding rail. It is also lightweight for easy portability (300 pounds). The downsides include the fact that it doesn’t fold and is most suitable for light duty cars due to its low lifting capacity. The Atlas LR-06P is a low-rise scissors lift from Atlas Auto Equipment with a lifting capacity of 6000lbs. it is highly versatile, thanks to its three locking positions at 12.25, 18.5, and 22.25 inches. It comes with air operated locks to provide maximum reliability while the ability of horizontal ramp locking allows you to extend it to runway length. Thanks to the high-density rubber blocks, you can easily lift your vehicle with the assurance that its lifting points will be protected. Its rubber top lifting surface also increases safety and protection from damage when servicing your car. It is cheaper than most other alternatives among the top 5 best car lifts. The Atlas MR-06 is a commercial grade portable car lift that offers a stunning lift capacity of 6,000 pounds. If you operate a body shop or a wheel service specialist where extra lifting height is frequently needed, this is the perfect portable car lift for you. It provides 4 locking heights, ensuring comfortable operation from under your light-duty truck or car. This lift is designed to [provide easy access to the car’s underside, more than most of its alternatives would. With this portable mid-rise scissors lift from Dannmar Equipment, you can service your car easily and efficiently. It has a portable cart that also serves as a tow handle to allow easy movement from one bay to the other. It is also highly versatile, thanks to the multi-position safety lock and adjustable arm assemblies. In addition to a strong 6000lb lift capacity, it has a total lift height of 36 inches, which is quite impressive. This portable car lift can be an ideal alternative to the BendPak 6,000lb unit, especially if you’re looking for a less costly option. However, the major downside is that it uses 120V power. 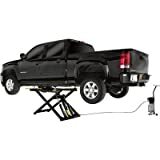 The BendPak Portable Mid-Rise Scissor Lift is a 6,000lb portable car lift that is designed for easy storage and easy fit underneath most vehicles. It is ideal for use on light-duty cars and trucks. One of its perks includes the fact that you can raise it to full height in under a minute, thanks to its single phase 110-220V efficient electric motor that allows smooth and quick lifting. It has a portable motor cart that also serves as a tow handle for easy bay-to-bay movement. The multi-position safety lock bar, as well as the adjustable arm assemblies, give it a safer and way lot more flexible operation. However, it is more expensive than most of its competitors in the market. 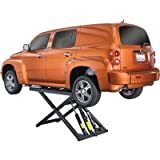 As far as the top 5 best car lifts are concerned, each of the above products is great portable car lift models as long as it can hack the weight of your vehicle. Based on features and overall performance, however, the BendPak 6,000lb Portable Mid-Rise Scissor Lift tends to have more perks than the others despite the fact that its pricing is a bit higher.